James Bryce writes to Woodrow Wilson about a visit from Jessie and Francis B. Sayre as well as the Mexico situation. 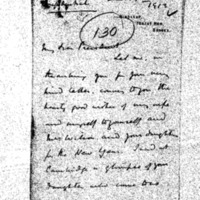 Let me, in thanking you for your very kind letter, convey to you the hearty good wishes of my wife and myself to yourself and Mrs. Wilson and your daughters for the New Year. I had at Cambridge a glimpse of your daughter who came to us as a bride: she and her husband had a most cordial welcome at the Trinity College Commemoration there; and everyone was rejoiced to see them. You made a happy selection in Mr. Page. He seems to be universally liked and respected here. For yourself, I can wish nothing more than that the coming years should be as successful as this first year of your Presidency seems to have beenAbout Mexico. Huerta seems to be a ruffian of the usual type of military adventurer, and we should all be glad to see him disappear. But there is little prospect that any one who succeeds him will be more scrupulous. What I learnt about the conditions of Spanish America in travelling there has made me fear that the only thing to be hoped for those countries (I except Chile & Argentina) is that the adventurer who climbs to power should be at least a man of governing capacity, able to maintain order and to see what can be done to improve the material resources of the country and material state of the people, & to give them a chance, through settled life, of reaching a higher level. Diaz was doing that, if imperfectly; and if his regime had lasted another half century, Mexico might have reached the point where Argentina is now. But Argentina has a European population; and even there constitutional government in our sense is only beginning. In Mexico out of 13 millions of people, 89 millions are Indians, ignorant & virtually uncivilized The Government of Diaz was a pure despotism, and had to be so for the conditions for honest elections and the peaceable rule of a representative assembly did not exist; any more than they would exist now in your Southern States if they were peopled entirely by negroes, or would exist in Egypt, or in India, if British rule were with drawn. For in Mexico the Mestizo population, less than half Spanish, who make up nearly all that is not pure Indian, have little more than a varnish of civilization. I earnestly hope in the interests of the United States, which are only less dear to us than those of our own country, and whose welfare is certainly not less important to all mankind, that your efforts to avoid intervention will be successful, for I can hardly think of any greater misfortune for the United States than to be obliged to set up a Government which it would have to maintian, or to become directly responsible for the administration of any Spanish American country. Bryce, James Bryce, Viscount, 1838-1922, “James Bryce to Woodrow Wilson,” 1913 December 19, WWP18231, First Year Wilson Papers, Woodrow Wilson Presidential Library & Museum, Staunton, Virginia.